You have questions ? We have answers. An inverter converts direct current (DC) from a battery or solar panels into alternating current (AC) to operate domestic electrical appliances. Photovoltaic solar panels power both the home network of the house and a battery park. When the instantaneous production of photovoltaic solar panels is equal to or less than the instantaneous consumption of the house, this production replaces the call to the public grid and generates savings. When the instantaneous production of photovoltaic solar panels is greater than the instantaneous consumptionof the house, the excess is stored in batteries, to be sent later to the domestic network. If your inverter fails, do not attempt to repair it by yourself. Call your installer. He is perfectly trained to perform a quality repair. If a defect is found, he will call the dealer who will be able to make a more precise diagnosis and possibly to provide the spare parts. The guarantee shall be valid for 10 years or 120 months in case of IMEON products connected to the Internet (the connection must be established for minimum of 95% of operating time). The guarantee shall be valid for five years or 60 months in case of IMEON products not connect to the Internet. Your IMEON inverter has an LCD display on the front panel that allows you to check its status and its function mode. Thanks to its built-in Wi-Fi, you can monitor your entire energy production and consumption on a computer, a tablet or a smartphone. 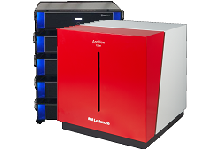 IMEON inverters are among the most reliable and robust on the market. Coming from more than 3 years of research and development, they are compact and real All In One. This means that it can operate in 4 different modes (On-Grid, Off-Grid, Back-up, ou hybrid mode). They adapt themselves to all configurations. 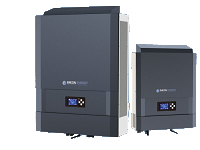 By integrating an inverter, a load regulator and a source inverter, they simplify the implementation and greatly reduce the installation time. Imeon is the nerve center of your solar installation. It is an intelligent inverter that optimizes efficiency by choosing the best mode of use: direct consumption, storage of surplus, use of the grid. For loads connected to the AC Grid, there is no limitation. For loads connected to AC Backup Output (essential loads output) the max limit is equal to inverter’s power rating, thus 3kW for IMEON 3.6 and 3kW per phase for IMEON 9.12. As IMEON 3.6 is a 3kW maximum inverter, you cannot install all consumers on its Output. In this scenario, you can use IMEON 3.6 installed in parallel to grid with Smart meter. The inverter will offset the peak power consumption by 3kW maximum (to 7kW) assuming that PV and/or battery power is available. IMEON inverters come with an integrated AC Backup Output for essential loads. The switchover time from grid to battery is less than 20ms. Not yet, our engineers are working on that technology. One can set DOD with grid to 50% while setting DOD without grid to 90%, which would result in minimum 40% of the capacity being available in the event of grid failure. You can use lead acid or lithium batteries. Use lead acid batteries corresponding to Imeon specification. Use only lithium batteries approved by Imeon (see website). Keep in mind to adapt the size of batteries to max charge / discharge current the battery will be subjected to. Follow the recommendation of the battery manufacturer. The battery BMS is responsible for setting the charging and discharging currents with respect to its capacity. Follow the recommendation of the battery manufacturer and always design the battery bank to allow the inverter to attain its max charge / discharge currents. For example, the max discharge current of Imeon 9.12 is 200A. The installer is considering using a 100Ah battery rated 1C (max current of 100A). As a result the inverter, while working only on the battery (no PV, no grid) can only output approx. 48V x 100A = 4800W, which is well below the inverters rated output power and should therefore be avoided. Because Imeon inverter is transformerless, only two types of PV modules are acceptable: mono crystalline and poly crystalline. Do not connect any PV modules that may introduce leakage current to the inverter (such as non-grounded PV modules). Refer to technical datasheet of the PV modules. NOTE : The PV DC voltage and current must be within the MPP range of the MPPT Input. Refer to product documentation. Check if the batteries are in good condition and the nominal voltage is 48 Vdc. NOTE The inverter will detect the batteries of 12V or 24V, however it will not be able to use them. Check if the battery technology selected in the Imeon Manager software is ‘Lead-acid/GEL/AGM’. Check if the batteries are in good condition and the nominal voltage is 48 Vdc. Check if the battery you’re using is supported by Imeon, the list of compatible batteries is available on our website. Check the wiring of your CAN connection cable (if applicable). Pinout of the RJ45 connector on the Imeon side can be found in the installation manual. Pinout of the RJ45 connector on the battery side must be provided by the battery manufacturer. Check if the battery status in the Imeon Manager software is ‘Battery Operating’. If this is not the case contact the battery manufacturer. Reduce the load below the PV power available, so the batteries can be charged by the PV. Check if the batteries are detected by the inverter. Check if the battery is in good condition and if the terminal voltage is around 48Vdc. If the battery voltage drops below a voltage of 40V it is not possible for the inverter to recharge it. Check if the externalfuses of the batteries are not blown. NOTE : In the Smart Grid and Off Grid Mode the inverter will send the power generated by the PV array to the load, only charging the surplus of power to the batteries. In the Backup mode the inverter will charge the batteries first and discharge them only in case of a grid failure. NOTE : Some lithium batteries require ‘forced charging by grid’ when SOC approaches deep discharge level, which makes them unsuitable for off grid installations. Contact the battery manufacturer for more information. Check if the battery is in good condition and if the terminal voltage is around 48Vdc. Check if the batteries icon on LCD is flashing. If so, that means so batteries has been fully discharged and need to reach a full voltage before it’s possible to discharge them again. Check if the absorption and float voltages are configured correctly. Check the size of the battery bank. NOTE : It’s possible that SOC value changes dramatically as a result of a transient response to a load step. Verify well if the size of the battery bank used is appropriate for the charge / discharge currents the battery is subjected to. SOC is managed by the BMS of the battery. Contact battery manufacturer in case of any irregularities. Check the size of the battery bank with respect to charging / discharging currents the inverter is subjecting it to. Check if the battery is not reaching end of life. Lithium technology implies a BMS integration which needs to be supplied. Power will come in priority from battery, and as a result, the battery SOC can go at lower level. The loads seen by the inverter are those situated at the AC OUTPUT and on the local grid when a smart meter is used. PV modules are subject to standard test conditions that are defined with particularly strict certifications (IEC, ISO). From idealistic radiance test conditions (1000W/m² at 25°C) result the provided voltages, currents and temperature factors that you can read from your PV modules specifications. Note that temperature plays an important role: an increase in temperature (i.e 0°C) can result in the modules generating less power. Your must also consider all possible cable losses (PV installation area) that can count for 3% and a 1% maximum in the mppt yield. Open the circuit breaker between the PV and the inverter and measure the DC voltage between (+) and (-) terminals of the PV string. NOTE : Keep in mind to take into account the difference between the open circuit voltage and nominal voltage of your PV array. If you’re measuring Voc that is slightly above the inverter’s minimum MPPT input voltage, it’s very likely that the Vmp PV voltage will be below minimum MPPT input voltage. Measure the PV voltage +/PE, -/PE and +/- in order to identify the earth leakage from a positive or negative pole of the string. Verify if open circuit voltage and short circuit current of the array are well within the values specified for your Imeon model. Make sure to read more than 600Ohms (Imeon 3.6) or 1Mohms (Imeon 9.12) while measuring +/PE and -/PE. NOTE : Breaching maximum voltage and/or current may result in equipment failure. Verify the Voc and Isc before attempting to connect the solar array to the inverter and take in account the temperature coefficient. Check if the time range is set correctly in IMEON WEB MANAGER, BATTERY tab, “Batteries charged by the Grid from < > to < >” option. Check the connectors, check if the grid has not been connected to AC Backup Output, check phase rotation (IMEON 9.12). Check if the voltage and frequency are on the selected standards ranges. Inverters anti islanding protection may be triggered by voltage or frequency fluctuation. If this is the case the grid symbol on Imeon LCD will be flashing. Check if the feed in to grid in the Imeon Manager software, Flow tab is enabled. Verify if the PV production is higher than loads connected to the AC Backup Output, loads connected to the AC Backup Output and that the battery is not being charged. Check the position of the SmartMeter in your installation. Note that in order to function correctly the Smart Meter must measure only the power coming and fed back to the grid (not power fed to the loads by Imeon). Verify the pinout of the RJ45 connector, as well as crimping quality. Check the cable between the meter and the inverter by measuring the impedance between the connector pin and SmartMeter. Refer to the installation manual of the inverter. Make sure you RJ cable is well connected to the RS485A port of the inverter. The RS4585A port LEDs blinking. A phone icon displayed at the SmartMeter’s screen. A meter icon displayed in the top-right corner of Imeon Manager software interface. Make sure the public grid is only connected to the Grid Connection socket and not the AC Backup Output socket of the inverter. Never connect the public grid or other energy source to the AC Backup Output socket. Check if the AC Backup Output has been activated. To activate AC Backup Output press and hold the OK button 3-5 seconds until an audible click can be heard, then release the OK button. The house icon and the arrow will appear on the LCD, indicating that the output of the Imeon is activated. The load connected to the AC Backup Output (essential load output) is higher than the rated output power of the inverter. If the overload is higher than the inverter’s overload capacity (refer to installation manual) it will go to security shutdown. Decrease the load connected to the AC Backup Output of the inverter, below the inverter’s rated power. Consider migration to installation in parallel to grid for equipment security. Check if the user profile has been created, this is a responsibility of your reseller. Check if you’re using a compatible web browser. Do not use Internet Explorer® or Microsoft Edge® to use IMEON Manager or IMEON Monitoring Portal. Check if the inverter serial number of assigned to your profile corresponds to serial number of your IMEON inverter. Verify that the time and date settings of your inverter correspond to your local time. Verify your network settings make sure the DHCP has been activated. Verify if the inverter is connected to the internet (you should be able to use IMEON WiFi to surf on the internet). Verify if the software version used by your inverter is 1.7.6.2 or higher (see tab “About”). To update your inverter contact your reseller or IMEON support team. NOTE : Make sure to inform your reseller or IMEON support team of the software package version currently used by the inverter. 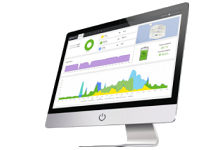 It takes approximately 3 minutes to actualize data from your inverter until it comes available for remote monitoring. Your system get ‘stuck’ for some time due to a communication drop-off (Weak Wifi signal strength, temporary internet provider loss), and you can end up by keeping watching the same information displayed. Simply think about refreshing your web pages displayed from in web browser (F5 shortcut). Datas are reported on a 15mins period. Graphics will be enriched and contain further informed Y axis. Some algos are to take place in lieue of some of the fields currently notified as ‘coming soon’. When the Wifi drops-off for less than 10min, the monitoring interface tries establishing another connection. However, if communication drops off for more than 10mins, the system attempts another try 2 hours later. NOTE : The is no available Wifi On-Off soft-switch available today from the interface though this control will be implemented in a near future. Check if pressing any button activates the backlight of the LCD screen. Disconnect all power sources Grid Connection, AC Backup Output, DC Battery and PV Input. Wait 15 minutes before connecting only the public grid to the Grid Connection socket. The display will switch on after 3 seconds.